Medium Weight Breaking and Lunge Cavesson. It is shown here with the Tubular Web Lunge Rein CE-LUWL. 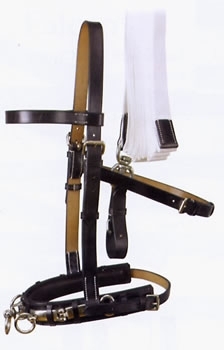 These high quality English leather quick release draw reins are supplied with a leather girth loop. The reins are available in havana brown only.